BMW premiered its new Z4 premium roadster at the 2009 Detroit auto show in January. The Z4 is offered with a choice of three different engines. Getrag's seven-speed dual-clutch transmission is an option in the top-of-the-range engine variant, the sDrive 35i with 306hp. The sporty gearbox minimizes loss of traction during shifting, allowing the vehicle to accelerate from 0 to 100kph in 5.1 seconds. Edscha GmbH supplies the Z4's lightweight aluminum hardtop, which opens electro-hydraulically at the touch of a button. Edscha's design gives a trunk capacity of 310 liters when the roof is closed, approximately 50 liters more than the previous-generation model. The German supplier produces hardtops for the Z4 and 3 series at BMW's assembly plant in Regensburg, Germany. Edscha also produces the roof system for previous-generation Z4, although the roof was then made of fabric. 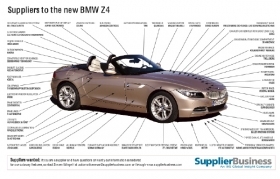 The new Z4 is the first BMW roadster with a folding hardtop. German suppliers Continental AG and Draexlmaier make important contributions to the vehicle. Draexlmaier developed and delivers engine harnesses just-in-sequence to BMW, along with the center console, instrument panel and door panels. Continental's content includes control units to regulate a range of products, including the engine, damping system, electric parking brake and vehicle telematics. The new Z4 is built alongside the 1 series and 3 series in Regensburg. BMW made the previous-generation Z4 in the United States but has since decided to build its X3, X5 and X6 crossovers there. The new Z4 starts at €36,200 in Germany.